DESCRIPTION OF THE BOOK: Based on a true story! Join a young boy and his father on an arduous journey from Mexico to the United States in the 1980s to find a new life. They’ll need all the courage they can muster to safely cross the border — la frontera — and to make a home for themselves in a new land. Inspired by the childhood immigration experience of co-author Alfredo Alva, this story of perseverance is told in both Spanish and English to empower language-learning. Includes 4 pages of endnotes that unpack facts about Alfredo’s story and other stories like his and borders around the world to help parents and educators talk with children about immigration, resilience, empathy and belonging. 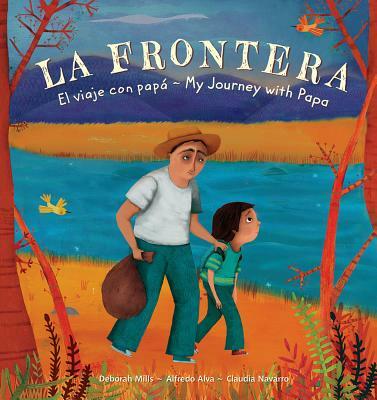 MY TWO CENTS: This bilingual picture book tells the story of Alfredo Alva (a co-author) who leaves his family and home in Mexico to make the journey to the United States with his father. Told from the child’s perspective, Alfredo tells the reason why his father makes the difficult decision to make the harrowing journey to the U.S. by stating that he “could no longer provide for our growing family” (n.p.). The language that is used is simple, yet powerful. Alfredo makes the poignant statement in thinking about leaving his Mama and brothers: “I was hungry, yes, but I did not want life to change” (n.p.). Their journey, like that of so many, is difficult and they pay a coyote to guide them in their journey across the border to the U.S. Alfredo and his father are abandoned by the coyote, and they must make the journey through the dessert on their own and on foot. Alfredo documents how they traveled and the dangers they encountered, “We started walking at dawn every day, and we walked for five days. There was no path, and the brambles ripped my clothes. I had many cuts. When I sat or slept on the ground, I got bitten by fire ants, and I was always watching for scorpions and snakes.” Eventually, they reach their destination. Alfredo begins to attend school, he learns English, and makes friends. Alfredo and his father are able to begin the long process of applying for citizenship through President Reagan’s amnesty program. Alfredo does not see his mother and brothers for four years. The illustrations in this book are vivid and bring life to the experience that Alfredo is describing. They also depict the sense of sadness that Alfredo feels when he finds out he will be separated from his family, they depict the harshness of the trip, and also capture the closeness and love of family. This is a timely and very important book that shows the difficult choices that parents must make to provide a better life for their children. It also showcases the love that Alfredo’s father has for him as he carries him through some of the journey and tries to provide comfort in any way to his son. The book also showcases the difficulties that children experience when they leave their families behind, travel through the dangerous terrain, and begin life in a different country. This book provides an excellent space for discussions about the immigration experience, the journey that families make, and the difficulties in adjusting to a new life. One of the best features is that it is told through the perspective of a child and therefore can provide a window into the difficulties into the immigration journey that so many children experience. The educational end notes provide four pages detailing Alfredo’s story, describing borders and cultures, and reasons why people immigrate. The end notes also provide real pictures from Alfredo’s family. This book is a heartfelt and moving depiction of a family’s difficult decision to immigrate and a child’s experience in that journey. It is a must have in classrooms and libraries. 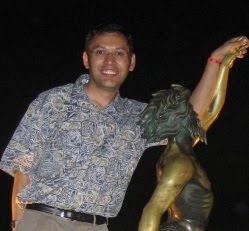 ABOUT THE AUTHORS: Alfredo Alva was born in La Ceja, Mexico. He came to Kerrville, Texas, with his father when he was eight years old. He is now married with two children and runs a successful masonry business. He wanted to share his story because he sees immigrants facing the same difficulties today that his family faced over thirty years ago. Deborah Mills studied architecture and worked in the field while living overseas with her husband and five children. She now divides her time between Kerrville, Texas, and Thousand Islands, New York. When she met Alfredo’s family and learned his story, she wanted to write it down and share it. She believes that all children everywhere need to understand this important piece of history. ABOUT THE ILLUSTRATOR: Claudia Navarro studied at the Escuela Nacional de Artes Plásticas UNAM in Mexico City, and has illustrated for clients around the world. She lives in Mexico City. DESCRIPTION OF THE BOOK: The Princess and the Pea gets a fresh twist in this charming bilingual retelling. El principe knows this girl is the one for him, but, as usual, his mother doesn’t agree. The queen has a secret test in mind to see if this girl is really a princesa. But the prince might just have a sneaky plan, too. Readers will be enchanted by this Latino twist on the classic story, and captivated by the vibrant art inspired by the culture of Peru. MY TWO CENTS: In this beautifully illustrated book filled with rustic textures and warm colors comes a popular tale filled with humor and reminiscing of Latinx mother-son relationships. Readers are invited to join the quest as the queen and the prince (but mostly the queen) try to find his future wife. The queen’s love for the prince is obvious, as she expects nothing but perfection for her son. The distinct comparison between the queen and her cat’s facial expressions are priceless and bring to the reader’s attention what else they have in common–cattiness and dominance. And rightly so; that’s her hijito lindo. Then comes a fair maiden, ready to prove her love for the prince, as he also awaits her success in the queen’s test. However, nobody is aware of this test besides the queen. The true test is if she feels the pea under twenty mattresses, then she’s the one. Yes, TWENTY. VEINTE. Will the maiden pass this impossible challenge? Will the prince be able to be with his one true love? Will the queen finally give her blessings to her son and his future wife? If you grew up with a brother, you can totally relate to this mother-son relationship. The bond between mother and son is like no other, however this story will force you to reminisce about the times that your mom said, “Ay, mijito, let me warm your dinner” to your brother but then expected you to warm up your own dinner. Jealous? Maybe. As an adult reader, I couldn’t help but chuckle at the realistic dialogue between the Queen and her Prince, as well as the perfectly paired facial expressions between the queen and her cat, which added to the character’s moods. You can feel the prince’s desire for love, but, at the same time, he wants to respect his mother’s opinion. This picture book’s story line will keep you laughing, as it creatively tells the story of an unbreakable mother and son bond. I absolutely appreciate a picture book that can naturally weave in the Spanish language in dialogue and its narrative text without making it awkward for the reader. The Spanish vocabulary was also highlighted in a different text, to accent its beauty throughout the story. The words fit in a natural way of storytelling. The illustrations were stunning. Upon reading the illustrator’s note by Juana Martinez-Neal, readers discover that the illustrations are inspired by an indigenous group in Peru. The textiles and the culture’s tradition of weaving and embroidery were inspirations for the illustrations and use of color. Martinez-Neal’s attention to detail and inspiration for her illustrations are remarkable and admirable. TEACHING TIPS: Teachers of all grade levels can use this picture book as a reading mentor text to highlight various character traits and motives, with a focus on the queen. Also, for our younger readers, this text can be used during a phonemic awareness lesson on rhyming words in English. The inspiration behind the illustrator’s choice of texture and color can also be used in an art lesson about artists and how cultures and traditions inspire their work. 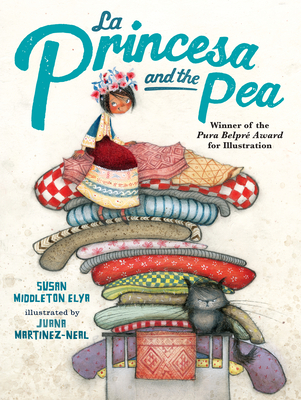 WHERE TO GET IT: To find La Princesa and the Pea, check your local public library, your local bookstore, or IndieBound. Also, check out Goodreads, Amazon, and Barnes & Noble. 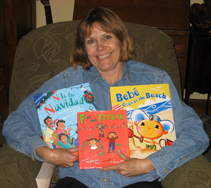 ABOUT THE AUTHOR: Susan Middleton Elya is a popular children’s author with over 22 picture books. Her series Say Hola to Spanish and Eight Animals are distinct in how they introduce the Spanish language to all age groups. Susan’s journey as an author started at a young age with a passion for writing. Her love of language led her to study Spanish and incorporate the Spanish language and her teacher experiences within her children’s books. ABOUT THE ILLUSTRATOR: Juana Martinez Neal is an award winning illustrator and artist. Her passion for art started as a child and led her to study at one of the best schools in fine arts in Peru. Her journey as an illustrator led her to the United States, where she continues to illustrate a variety of children’s books. Alma and How She Got Her Name, her debut picture book as an author illustrator, will be published in both English and Spanish by Candlewick Press on April 10, 2018. It’s an ongoing challenge for our family to find high-quality books in Spanish, and it is even more difficult to find bilingual editions where Spanish and English are presented as equals. This beautiful children’s book offers a novel solution: its sturdy cardboard accordion-style construction can be read from either side. One side offers the classic words to “Las mañanitas,” and the other presents an English version. The same design can be found in three other Canticos books, which you can discover here. DESCRIPTION FROM THE PUBLISHER: The fourth book in the Canticos series of bilingual nursery rhymes was inspired by the most popular birthday song in Spanish. Fans of the series will recognize a cast of characters from the Canticos collection who wake up their bunny friend on his special day and then partake in a joyful, cake-filled, celebration in The Birthday Book / Las Mañanitas. Like other Canticos books, The Birthday Book / Las Mañanitas has a unique, interactive, accordion design that presents the Spanish version of the book in one direction and its English adaptation in the other. Children can sing the song straight through, lift the flaps, or stand it up and surround themselves with the story. I loved the look of this book, but I didn’t know if Ethan Andrés, our board book reader, would take to it. At first, he was most interested in unfolding all the pages and spreading the book out across the floor. Then he spent time lifting all the flaps on the pages. (His favorite part is the peek-a-boo hands of the monkeys.) Now, it is a bedtime staple, and we usually read it like a “regular” book rather than spreading it out. The novelty of the liftable flaps has not worn off for Ethan Andrés, and he loves “uncovering” the sleeping bunny to wish him feliz cumpleaños. Other sweet details abound, from a drawing of a chick that says “pío, pío” (the sound chicks make in Spanish), to the friendly animal cast. The high-quality construction and simple elegance of the book make it excellent for a gift for a beloved child. The book comes in a sturdy box for added protection. A free app provides grown-ups and kids alike with the tune that accompanies the song, so there’s no need to worry if you don’t know it already. And as you can tell from the video below, I’m no singing diva, but my kiddo doesn’t mind… he’s too busy “finding” the animals under the flaps. I look forward to adding more of the Canticos books to our collection, especially “Los pollitos,” as that traditional song is one of Ethan’s favorites. “Las Mañanitas/The Birthday Book” won’t be for sale until mid June, but you can preorder it now. And you should! *Note: a copy of this book was provided by the publisher for our review. Liam Miguel reads to his baby brother, Ethan Andrés. As a bilingual mother and early literacy advocate, I’m always on the look out for high quality baby books in Spanish. The selection at big-box bookstores is often limited to simple board books with titles like La ropa, La comida, and so on, some of which I’ve found to have spelling or accent errors. And anyway, I want something richer and more interesting, something that will invite Spanish into the interaction. Which is why I was thrilled to discover these beautiful books to read, touch, and hear with babies. The books featured here are distributed through IPG, Independent Publishers Group. But this is only the tip of the iceberg. Librarians, teachers, and interested parents should check out the IPG Spanish-language catalogs for many more options. IPG titles are now my go-to when it’s time to pick out gifts for new babies in bilingual or Spanish-speaking households. Here are a few baby books that have become favorites in our household. DESCRIPTION: This ingenious lift-the-flap book about numbers also features peepholes to give children a clue as to what lies beneath. The rhyme on each page encourages young readers to discover what’s hiding and to count the objects. WHAT WE LOVE ABOUT IT: The page-size flaps are oh-so-inviting for chubby little baby fingers–and sturdy enough to stand up to their vigorous “loving.” This is one of Ethan’s go-to bedtime books, and he enjoys the bright colors of theillustrations and the way that the set of objects that appears when the flap is closed changes when the flap is opened. For example, underneath the flap, the mice on the page for “7” become skittish elephants surprised by the rodents. The face of each elephant is partially concealed by the cut-out that creates the shape for each mouse’s body. Loads of fun. DESCRIPTION: Colorful illustrations, flaps that can be lifted, and varied textures combine in this engaging book to introduce children to a range of baby animals. As kids interact with the elements on each page of this didactic and fun book, they’ll learn more about foals, fawns, bear cubs, and a number of other animals. WHAT WE LOVE ABOUT IT: This book has beautiful images and wonderful textures, which our baby loves. It also has interesting science information that keeps my older son engaged and asking questions. The page on mammals–complete with animals nursing–is especially fun to talk about since his baby brother is breastfeeding. DESCRIPTION: Nocturnal animals such as the owl, the bear, and the wolf come to life for little hands in this delightfully interactive book. Each page spread presents a different animal that children can touch and a sound button that lets them know what noises the animal makes. This book is an engaging, entertaining way for very young readers to start learning about the natural world. WHAT WE LOVE ABOUT IT: This is a book with something for everyone. Ethan Andrés loves the furry critters, and Liam Miguel “helps” his brother press the sound buttons. I don’t know if it’s the night sounds or the tickle of his brother’s hand on his, but the experience always gets Ethan giggling. I’m not usually a fan of books or toys that make noise, but these sounds are pleasant and last a reasonable duration. P.S. The books featured here were received from IPG, which does an excellent job of curating and distributing some of the most beautiful and distinctive Spanish-language materials available in the U.S. I’m a fan. ABOUT THE REVIEWER: Ashley Hope Pérez is a writer and teacher passionate about literature for readers of all ages—especially stories that speak to diverse Latino experiences. She is the author of three novels, What Can’t Wait (2011) and The Knife and the Butterfly (2012), and Out of Darkness (2015), which won a Printz Honor. A native of Texas, Ashley has since followed wherever writing and teaching lead her. She completed a PhD in comparative literature from Indiana University and enjoys teaching everything from Spanish language and Latin American literature to the occasional course on vampires in literature. She can also be found on Twitter and Facebook. DESCRIPTION OF THE BOOK: Tomorrow is the school parade, and Danny knows exactly what he will be: a princess. Mommy supports him 100%, and they race to the thrift store to find his costume. It’s almost closing time. Will Danny find the costume of his dreams in time? One of A Kind, Like Me / Unico como yo is a sweet story about unconditional love and the beauty of individuality. It’s a unique book that lifts up children who don’t fit gender stereotypes, and reflects the power of a loving and supportive community. The book is written by Laurin Mayeno, illustrated by Robert Liu-Trujillo, and translated by Teresa Mlawer. 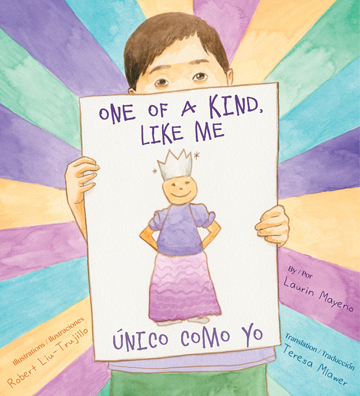 MY TWO CENTS: One of a Kind Like Me/Único como yo is a book every elementary school should own. It takes the subject of gender identity out of the public discourse, where morality and religion weigh heavily in the debate, and puts it into the personal realm of a young boy named Danny/Danielito. Teaching readers about gender expression from a child’s point of view does exactly what children do best – cut right to the heart of the matter. Danny is clear about wanting to dress as a princess for the school parade. His determination and creativity were inspiring to me as an adult reader, yet the book offers a beautiful lesson about the importance of listening to yourself and following your dreams to young and old readers alike. Beyond the gift of the story itself, the book is written in both Spanish and English, providing entry to ideas about gender expression that I have not often encountered in traditional bilingual books. Finally, the ultimate confrontation that Danny/Danielito has with his friends offers a promising way for readers to consider how to react to someone who expresses them self in a way that challenges notions of binary gender roles. While the book is written for children, I’d recommend it as a gift to anyone who might expand their thinking on gender expression. TEACHING TIPS: One of a Kind Like Me/Único como yo can be used in any elementary school class to begin a discussion on self-expression. A discussion question like: What are the different ways we express to the outside world who we are inside? might be an interesting entree. I’d also strongly recommend it to discuss bullying. For example, What did the kids at school do to make Danny/Danielito cross his arms? How did he deal with it? This could also be a way to get children to talk about experiences they’ve had with bullying, both as perpetrators and victims. That conversation can easily lead to having children brainstorm ideas of how to respond effectively to bullies. For older children in fourth and fifth grade, this book can be used to discuss gender identity and gender expression and how peer groups influence choices about what we share about ourselves and how we share it. It connects well with a talk about peer pressure and how to get in touch with our own sense of what is right for us and what isn’t. Finally, there is an excellent note at the back of the book to parents, caregivers and educators that provides an additional resource where one can access videos, books, guides, organizations, and other services that can be of assistance to anyone wanting to learn more about gender diversity. 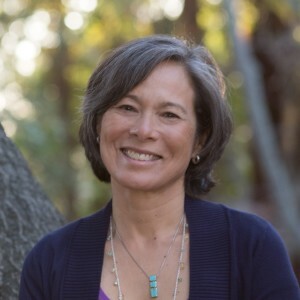 ABOUT THE AUTHOR: For more than 17 years, Laurin Mayeno has provided consulting services to numerous organizations, resulting in greater diversity, more inclusive and equitable work environments, and improved effectiveness working with diverse populations. Laurin’s experiences as a mixed race woman growing up during the social movements of the 1960s, led her to work that fosters inclusion, equity and full appreciation for cultural diversity. Her experience as the mother of a gender-expansive, gay son, also gave her a deep appreciation for importance of responding to gender diversity, which is now a central focus of her work. Her Proud Mom videos and her bilingual children’s book One of a Kind, Like Me/Único como yo are among the resources she has developed to spark dialogue and understanding. ABOUT THE ILLUSTRATOR (From his website): My name is Robert Liu-Trujillo. I am the author and illustrator of Furqan’s First Flat Top. I was born in Oakland, California and raised all across the Bay Area. I’m a visual artist, father, and a husband who employs the use of illustration, public art, and storytelling to tell tales. These tales manifest in a variety of forms and they reflect my cultural background, dreams, and political / personal beliefs. My motivation to do what I do is to unearth beautiful and un-told stories, to be a positive and nurturing influence on my son, and to honor my ancestors and family who worked so hard for me to be here. I love music, nerdy things, and can get along well with most people. I seek fun, ice cream, and justice. I’m also a co-founder of The Trust Your Struggle Collective, a contributor to Rad Dad, and the founder of Come Bien Books. DESCRIPTION FROM THE BOOK JACKET: Sofía has discovered a BIG secret. Mamá is an alien–una extraterrestre! At least, that’s what it says on the card that fell out of her purse. But Papá doesn’t have an alien card. Does that mean that Sofía is half alien? Sofía heads to the library to do some research. She finds out that aliens can be small, or tall. Some have four fingers on each hand, and some have big round eyes. Their skin can be gray or blue or green. But she and Mamá look like human people. Could Mamá really be an alien from another planet? Filled with imagination and humor, Mamá the Alien/ Mamá la extraterrestre is a sweet and timely immigration story, and a tender celebration of family, no matter which country (or planet) you are from. Sofia researches aliens and wonders how her mother has hidden the fact that she is an alien from her. As Mamá gets ready for her citizenship ceremony, Sofía sees a shadow of her mom with rollers in her hair and tells her parents her suspicion about Mamá being an alien. Sofía learns that the word alien can have different meanings. Her mother explains, “Sofía, I’m not from outer space. What you saw was my old Resident Alien card. That card allowed me to live and work here in the United States.” The story comes to an end when Sofía’s mom becomes a citizen. This book provides a glimpse into one way a girl makes sense of a complicated immigration process. Few books allow the reader to understand the complexity of the immigration system in the United States through the eyes of a child. This book is an entrance into discussion of the complex process that families must go through to become American citizens. The illustrations are large and beautiful. In particular, the illustrator, Laura Lacámara, provides vivid pictures of the imagined aliens with humans. It is through the illustrations that we learn that Sofía’s mother is from El Salvador. A picture shows Mamá standing on an outline of El Salvador on a map. The illustrations provided in the thought bubbles add to the story and help the reader understand what Sofía is thinking about. TEACHING TIPS: Author René Colato Laínez wrote a blog post for Lee and Low books titled “No More Illegal Aliens.” In this post, Laínez discusses the use of the term “illegal aliens” and why he advocates for the use of the term “undocumented immigrants. 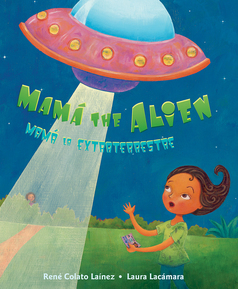 This blog entry could be used as a paired text with the book Mamá the Alien/ Mamá La Exraterrestre. Also, Lee and Low has developed an extensive teacher’s guide for Mamá The Alien/ Mamá La Extraterrestre. This guide includes vocabulary, discussion questions, specific activities for English Language Learners, and interdisciplinary activities. ABOUT THE ILLUSTRATOR: Laura Lacámara is a Cuban-born children’s books author and illustrator. Lacámara holds a Bachelor of Fine Arts in Drawing and Painting from California State University, Long Beach and studied printmaking at Self Help Graphics in East Los Angeles. Her love for writing and illustrating children’s books grew when she signed up for a children’s book illustration class at Otis College of Art and Design in Los Angeles, California. She is the author of Floating on Mama’s Song/Flotando en la Canción de Mamá (Junior Library Guild Selection, Fall 2010 & Tejas Star Book Award finalist 2011-12) and illustrator of The Runaway Piggy/El Cochinito Fugitivo (winner of 2012 Tejas Star Book Award) and Alicia’s Fruity Drinks/Las Aguas Frescas de Alicia. DESCRIPTION FROM THE BOOK JACKET: An eloquent and moving account of the tragic migrations of thousands upon thousands of children who are leaving their homes in Central America, often alone, to seek refuge in the United States. Why are they going and how does it feel to be one of them? What is this terrible trip like? What do their hopes and dreams for safety, a new life and a loving reception mean to them? A refugee from El Salvador’s war in the eighties, Jorge Argueta was born to explain the distressing choice confronting young Central Americans today who are saying goodbye to everything they know because they fear for their lives. This book is beautifully illustrated by master artist Alfonso Ruano. 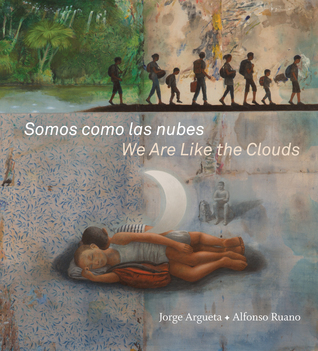 MY TWO CENTS: Somos Como Las Nubes/ We are Like the Clouds is a moving collection of bilingual free verse poems. This is one of the few books that I have encountered about the heartbreaking experiences of children who leave their homes to embark on their journey to the United States. This collection of poetry begins with poetry depicting the experiences and sights of the children’s home countries. The poetry then shifts to the journey that children take to get to the United States. The author includes poems that describe the fears of traveling on La Bestia (a fast moving moving train that many migrants use to travel), discuss being accompanied by “coyotes,” and describe children’s feelings as they cross the deserts. I’ll share one of the most powerful poems about the journey titled “Las Chinamas”. The word Chinamas refers to the border between El Salvador and Guatemala. I saw the river Paz. when I will see them again. What I loved about this book is that there is message of hope in knowing that children are resilient, but the author does not hold back in depicting the heartbreak that goes along with leaving a home country. The book allows the reader to the experience the treacherous journey to the United States through the eyes and wonder of a child. The pictures in this book are also stunningly beautiful. The pictures depict the children’s home countries, families crossing borders, and children laying on the soft sand in the desert. The final poems in the book offer hope. In the poem “Fear,” a mother tells her child in his dream, “This is not a dream, you are in my arms.” The child has arrived to his destination in Los Angeles. I shed tears when I read this book. It is heartbreaking and it is a poignant reminder that children are children and that there are difficult decisions that children should not have to make. In my opinion, what makes this book even more powerful is that it is written by Jorge Argueta. The author’s note at the beginning of the book shares Jorge’s own experience of fleeing El Salvador and coming to the United States. He shares his inspiration for writing the book by stating, “Like the clouds, our children come and go. Nothing and no one can stop them”. TEACHING TIPS: This book is an invitation to learn about the harsh realities that children face when they leave their homes and embark on the difficult journey to the United States. It would be a great addition to any classroom library. It would be an excellent book to add to text sets about immigration or refugees. Teachers can also use this book to teach children about writing through difficult situations. It can also be used to show students how illustrations can enhance poetry as this book is beautifully illustrated. To find Somos Como Los Nubes / We Are Like the Clouds, check your local public library, your local bookstore, or IndieBound. Also, check out Goodreads, Amazon, and Barnes & Noble. ABOUT THE AUTHOR: Jorge Tetl Argueta is a celebrated Salvadoran poet and writer whose bi-lingual children’s books have received numerous awards. His poetry has appeared in anthologies and textbooks. He won the America’s Book Award, among other awards for his first collection of poems for children, A Movie in My Pillow. 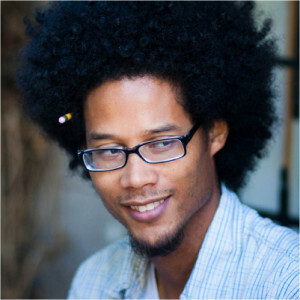 He was the Gold Medal Award winner in the 2005 National Parenting Publications Awards (NAPPA) for Moony Luna/Luna, Lunita Lunera. His other works for children include Xochitl and the Flowers, 2003 America’s Award Commended Title, Trees are Hanging from the Sky, Zipitio, Talking with Mother Earth, The Little Hen in the City and The Fiesta of the Tortillas. ABOUT THE ILLUSTRATOR: Alfonso Ruano was born in 1949 in Toledo, Spain. He studied painting at the School of Fine Arts in Madrid. He has published about 20 books for children and has received multiple awards for his work.